Shawn’s passion for art began at an early age. In his teenage years he used to experiment with oil medium hoping someday to paint like the masters. 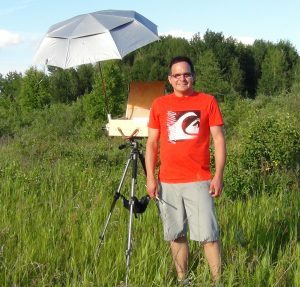 Today, Shawn is passionate painting subjects of abstract, figurative, floral, landscape, portrait, seascape, still life and wildlife. Shawn paints exclusively in the three primary colors of Cyan, Magenta and Yellow. He manufactures his own paint using specialized pure raw pigment and oil binder. He uses no fillers or additives that you would find in commercially manufactured paint. He makes his own “Primary Black” from the three primary colors. In addition to the primary colors, he uses pure Titanium Dioxide (PW6) opaque white paint. His brush of choice are “flats”. He loves to use palette knives as well for making impressionist markings on his masterpieces. Shawn has a doctorate in computer science. He also spent two years in a fine art school, under the guidance of his skilled instructor Laura, where he learned to paint in oils. You will often find Shawn and his best friend, Vincent Van Gogh, his toy poodle, outdoor painting. Shawn has done commissioned artworks and welcomes new clients.